It's hard to be surprised in the 21st Century. With comprehensively informative websites, nearly instantaneous reviews on travel sites and endless opinions on social media, sometimes it seems like the experiences are over before they've even happened. Like most travelers, we did some research before we went to Ski Portillo in Chile last summer. We reached out to friends asking which runs we should not miss. We cruised the resort's website and we checked a few travel reviews. 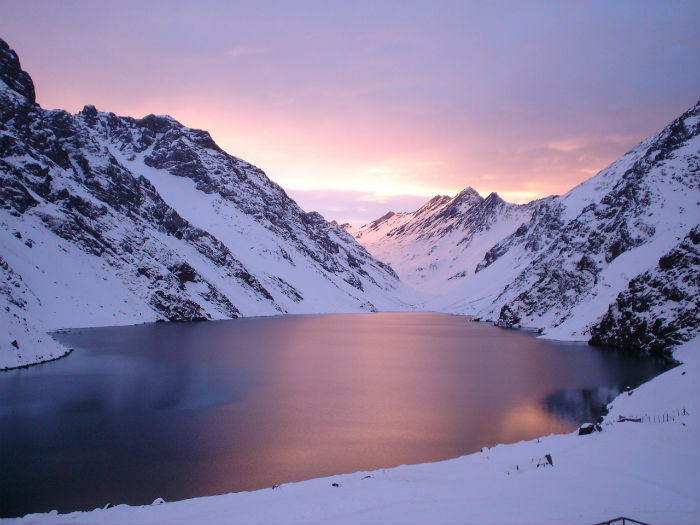 Whatever you've heard about skiing in South America, it's true and more. First, there's the landscape. Ski Portillo sits in a high, arid, rocky valley near 22,841-foot Mount Aconcagua, South America's highest peak. Just miles from the Chile-Argentina border, the resort is amazingly self-contained, a cluster of cabins and small dormitories anchored by the iconic blue and yellow Hotel Portillo. With the exception of a nearby Army base, there's nothing else: no shops, no restaurants, no gas stations, no development. The nearest town is Los Andes, 60 km (37 miles) away. There are also no trees. None. You leave the last trees behind when you gain altitude, and soon, the only vegetation is cacti. Eventually, even these eventually disappear. What you do get at Ski Portillo is a sky more blue than any blue sky you've seen before, where condors wheel on winds bearing incoming snow. You get Laguna del Inca, a gloriously reflective mirror of an alpine lake, and you get dramatic, weather-beaten cliffs, chutes and overhangs of granite, bountifully covered in pure, dry snow. Of course, it's this snow that brings us to Ski Portillo. In an average year, the resort gets 8 meters (27.3 feet) of Southern Hemisphere winter goodness, a perfectly timed respite for North Americans who are weary of the beach and summer. With 1,235 skiable acres and 14 lifts (including slingshots -- impossible to describe, but sensibly easy to ride), Ski Portillo is comparable in size to Solitude, Utah, with a fraction of the skiers. Most days, you'll find about 1,000 -- 1,500 people skiing. That's about 1 skier per skiable acre. A skier-load this low means that powder lasts for days after a storm. And that is the magic of the Portillo Experience: endless lines under rocky peaks rimmed by an endless blue sky. 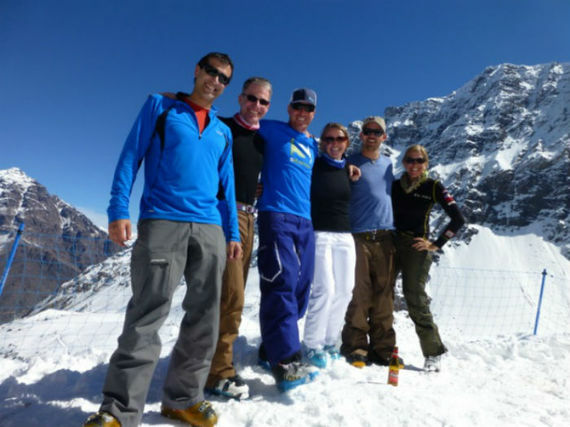 The resort has an outstanding ski school and plenty of immaculately groomed terrain for beginners and intermediates. Still, the real magic lies beyond the lifts, along the countless traverses, where you can stake a claim to a line and call it your own. 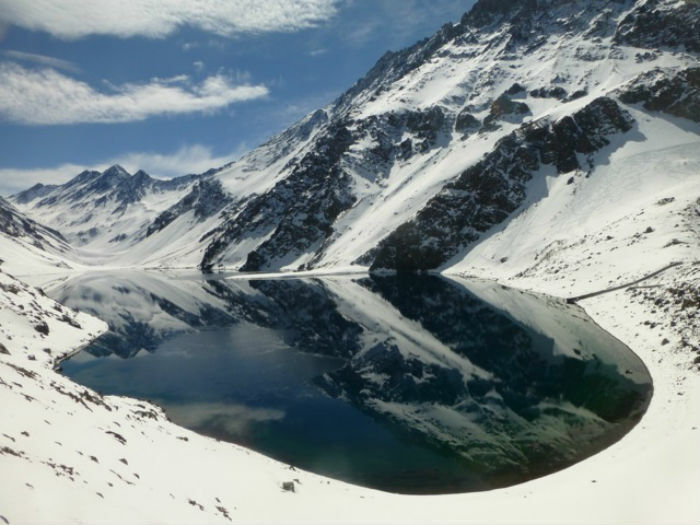 When we visited Portillo in August, the resort had just received its first snowfall in several weeks. The morning after the storm, we rode the Roca Jack slingshot lift and skied lap after lap on traverses both to the left and right. When it was time to recharge, we met up with friends at Tio Bob's, an on-mountain restaurant with a view that trumps any other view, anywhere. After a relaxing, sun-soaked meal, we were back at it, farming powder. Three days later, while we had to look a little harder, we could still find soft, lightly tracked snow, despite some areas of the mountain being closed. Even with reduced skiable terrain, we had plenty of challenge and nonstop fun. 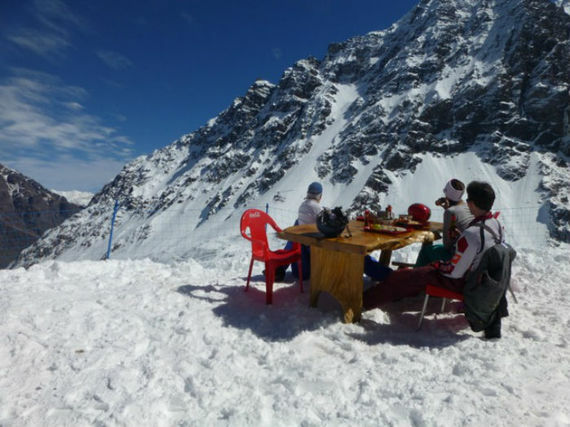 In addition to skiing, just being at Portillo is an experience. The Hotel is the resort's hub, with soothing outdoor hot tubs and a pool, a gym for morning and afternoon yoga, Chilean wine tastings during special wine weeks (worth planning for! ), and an elegant old-fashioned dining room where you take all your meals -- at the same table, all week long. The hotel also has a large living room for relaxing and mingling with other guests, a basketball/indoor soccer court, a movie room and a game room. The rooms, while modern and comfortable, are not ostentatious. I have a friend who likens a stay at the Hotel Portillo to being on a cruise. While I can see the similarities, I disagree. Cruises are relatively predictable. Skiing at Portillo is nothing but fantastically, perfectly surprising. 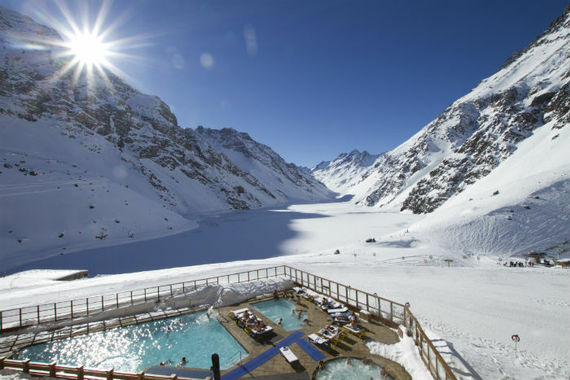 Unsurprisingly, a week at Ski Portillo is not cheap. But if you love to ski and live to ski, it's worth saving every penny to get there. In addition to rooms in the hotel, there are two hostel-style dormitories with reduced prices. The rooms are comfortable and you have access to all resort amenities, including meals in the dining room if you stay in the Octagon Lodge. If you stay in the Inca Lodge (the least expensive option), meals are served in the hotel's cafeteria.